Tracey Gajak’s top priority is to solve client issues in the most efficient way possible; he helps his clients to make sensible decisions for the short and long term. Tracey’s broad knowledge base works for clients whether they’re going to trial or settling out of the courtroom. He is known for his ability to quickly grasp the technical and factual strengths and weaknesses in any situation, and how to approach problems and procedures. Tracey’s broad knowledge base includes litigation, business scenarios, corporate law, child welfare and psychology. He understands the language of the experts, allowing him to efficiently move the case forward. He educates clients on the choices they have to resolve their particular issues, and how those choices matter immediately as well as far down the road. When children are involved, consideration of real life issues like future weddings, graduations, and grandchildren must be considered during the litigation process. Tracey understands that the choices made now will significantly impact the long term happiness of his clients as well as their children. 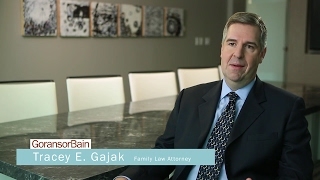 He has proven himself to effectively analyze and deal with the situations that arise in family law, and to find innovative ways to resolve problems. 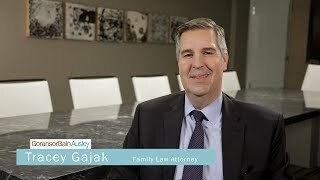 For family law clients who want an efficient and focused approach, Tracey Gajak will find their true needs and desires and get these accomplished as quickly, painlessly and economically as possible. Should I Settle Or Go To Court For My Family Law Case?